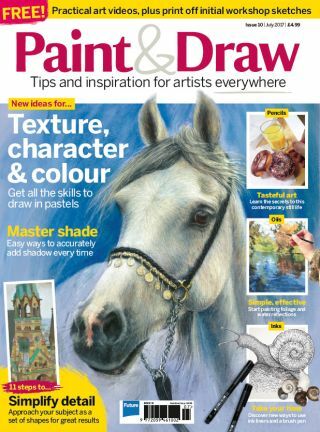 See what's inside the latest issue of Paint & Draw, on sale now! We've decided to shake things up in the latest issue of Paint & Draw with the introduction of a new regular feature. With Masterclass, we talk to renowned artists about the pieces of work that inspire them the most. Kicking off this feature is portrait artist David Cobley, who gives an impassioned speech about his favourite painting. We hope you find this a pleasant change of pace from all our hands-on tutorials and workshops! Buy issue 10 of Paint & Draw here! On top of this, our cover feature sees Paint & Draw's resident pastel expert, Rebecca de Mendonça, reveal how to create a beautiful, realistic illustration that guides the viewer's eye across the page. As if that wasn't enough, you'll also find a ton of our usual tips, tutorials and lessons to push your skills to the next level. Make sure you don't miss it! Subscribe to Paint & Draw here! In our easy to digest Bitesize tutorials, Sylvia Paul reveals how creating a collage can help you break out of an artistic routine. Rebecca de Mendonça helps you build up your pastel skills with the latest instalment of her in-depth feature. In this issue she shows you how she drew this stunning Arabian horse. Every artist has a medium that they struggle with. For Stan Miller, it's watercolours that prove to be a difficult tool to master. In this interview the American artist discusses how he keeps his passion for painting alive. When it comes to painting buildings, getting bogged down in details is a mistake that trips up a lot of artists. In this article, Amnon David Ar demonstrates how breaking buildings down into shapes can make the whole process a lot easier. Believe it or not, this amazing still life was created using just coloured pencils. Want to know how it was done? You're in luck! Steven Marquette is here to show you how he creates his realistic drawings that are bound to leave you hungry.